The unintended consequences of a centrally-planned world continue to peek through at the most unexpected of place, as moments ago the Indian Rupee just plunged to a new all time record low against the USD, with the USDINR rising over 60 for the first time, triggering stops and overriding any potential USD selling intervention that the RBI may have attempted just below the resistance level which took place 59.985 according to Reuters. 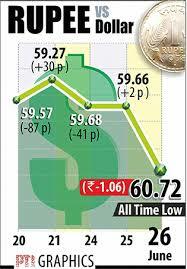 Rupee drops 0.9% to 60.2250 per dollar; touches record 60.26. Lets see how the Central bank enforces controls on the Gold market. Adding to it the further compounding desperation of the government to enact firm controls on the free dissemination of gold in a country which according to WGC estimates has 10% of all world gold in its possession (18,000-19,000 of accumulated gold stock) is that in India loans against gold are not only surging, but continue to be one of the primary means for citizens to monetize the gold in their possession, and to get paper currency from banks all too willing to lend out cash against gold.